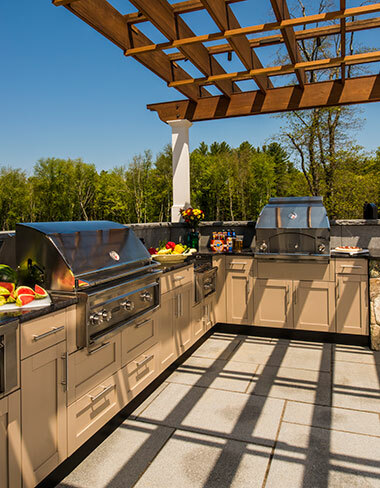 In today's homes, the backyard has truly become an extension of your living space and Chatham Outdoors has been at the forefront of helping clients create unique outdoor living spaces for over 20 years. We are your complete source for custom designed outdoor kitchens, outdoor fireplaces, fire pits, and pergola's. We also can create that perfect extended space with paver patios and protect you from the elements with a custom built pool cabana or screened room enclosure. Whether you love to entertain family and friends, or just want a personal backyard retreat, we have the knowledge, experience and professional design skills to turn your desires into reality. With many projects to our credit, you can feel confident in getting a beautiful finished product with 100% complete satisfaction and that ever important WOW factor! Are you building a new home, remodeling your current house or adding a pool? You should really consider an outdoor kitchen! We work with many top custom builders, masons, and pool designers in the industry. So remember to ask for us by name and get the quality and experience you deserve for your backyard project. We enjoy working on projects of all sizes and are experts at working within your budget and creating unique outdoor living spaces that can be a challenge for the inexperienced builder. Call us at 508-732-0011 for an in-home design consultation. You can also visit our beautiful showroom/design center in Plymouth, Massachusetts.